y = wlanHTSIG(cfg) generates an HT-SIG time-domain waveform for HT-mixed format transmissions given the parameters specified in cfg. [y,bits] = wlanHTSIG(cfg) returns the information bits, bits, that comprise the HT-SIG field. Generate an HT-SIG waveform for a single transmit antenna. Create an HT configuration object. Specify a 40 MHz channel bandwidth. Generate the HT-SIG waveform. Determine the size of the waveform. The function returns a waveform having a complex output of 320 samples corresponding to two 160-sample OFDM symbols. Generate an HT-SIG waveform and display the MCS information. Change the MCS and display the updated information. Create a wlanHTConfig object having two spatial streams and two transmit antennas. Specify an MCS value of 8, corresponding to BPSK modulation and a coding rate of 1/2. Generate the information bits from the HT-SIG waveform. Extract the MCS field from sigBits and convert it to its decimal equivalent. The MCS information is contained in bits 1-7. The MCS matches the specified value. Change the MCS to 13, which corresponds to 64-QAM modulation with a 2/3 coding rate. Generate the HT-SIG waveform. Verify that the MCS bits are the binary equivalent of 13. Format configuration, specified as a wlanHTConfig object. The wlanHTSIG function uses these properties. See IEEE® 802.11™-2012, Section 20.6 for further description of MCS dependent parameters. HT-SIG waveform, returned as an NS-by-NT matrix. NS is the number of time-domain samples, and NT is the number of transmit antennas. HT-SIG information bits, returned as a 48-by-1 vector. The high throughput signal (HT-SIG) field is located between the L-SIG field and HT-STF and is part of the HT-mixed format preamble. It is composed of two symbols, HT-SIG1 and HT-SIG2. 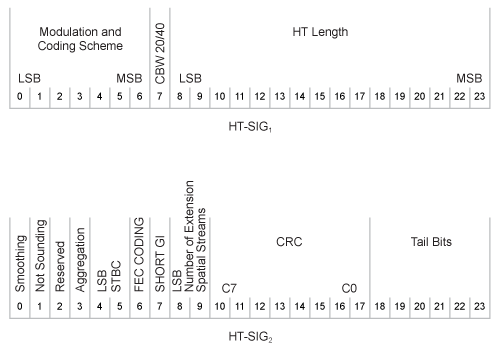 HT-SIG carries information used to decode the HT packet, including the MCS, packet length, FEC coding type, guard interval, number of extension spatial streams, and whether there is payload aggregation. The HT-SIG symbols are also used for auto-detection between HT-mixed format and legacy OFDM packets. Refer to IEEE Std 802.11-2012, Section 20.3.9.4.3 for a detailed description of the HT-SIG field. As described in IEEE Std 802.11-2012, Section 20.1.4, high throughput mixed (HT-mixed) format packets contain a preamble compatible with IEEE Std 802.11-2012, Section 18 and Section 19 receivers. Non-HT (Section 18 and Section19) STAs can decode the non-HT fields (L-STF, L-LTF, and L-SIG). The remaining preamble fields (HT-SIG, HT-STF, and HT-LTF) are for HT transmission, so the Section 18 and Section 19 STAs cannot decode them. The HT portion of the packet is described in IEEE Std 802.11-2012, Section 20.3.9.4. Support for the HT-mixed format is mandatory.